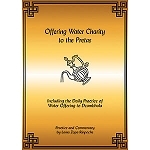 The practices of offering charity to spirits, pretas and nagas are often recommended by Lama Zopa Rinpoche - both for the benefit of the practitioner and for the benefit of the beings to which the practices are dedicated. 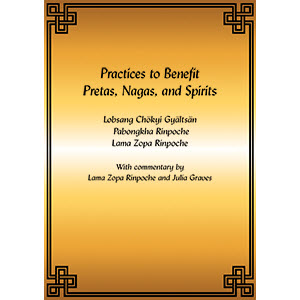 This new PDF compilation, Practices to Benefit Pretas, Nagas and Spirits, includes advice and commentary from Lama Zopa Rinpoche as well as translation and commentary from Julia Graves. 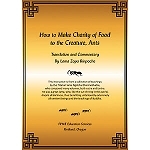 Lama Zopa Rinpoche recommends these practices as not only beneficial for the recipient spirits, pretas, and nagas, but also for the charitable practitioner herself. 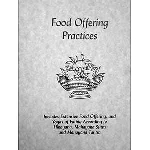 All three sets of practices in this book require the practitioner to have received a Great Chenrezig Empowerment. If you have not received a Great Chenrezig Empowerment, it is still possible to do the practices, but you may not do the self-generation as Chenrezig. Instead, at the point of the self-generation in the sadhana, visualize Chenrezig on top of your head performing all the actions in the practice.